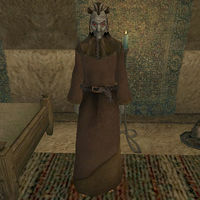 Ganalyn Saram is a Dunmer alchemist who sells all manner of alchemy supplies to all visitors from his shop in the center of the Hlaalu Canton plaza in Vivec. He is a restocking vendor of the following ingredients: Bungler's Bane, Corkbulb Root, Hound Meat, Kwama Cuttle, Scales, Spore Pod, and Willow Anther. He also has a complete set of Master's level apparatus for sale (it's in the crate in the back corner if you wish to steal them). This page was last modified on 24 March 2015, at 18:48.